Enjoy these deals as we celebrate our 1st Anniversary. ALL-NIGHT Happy Hour wine prices on Wednesday. Only RM12.90++ for 100 ml of Sauvignon Blanc or Cabernet Sauvignon. Only RM88++ per Bottle. Buy 1, get 1 free on selected gins on Thursday. Enjoy a fantastic 1 plus 1, when you purchase a glass of Bombay Sapphire, Opihr or Botanist gin. Enjoy 15% off all our main courses on Friday. Here's your chance to try all our mains that you might have missed out on, no excuses! 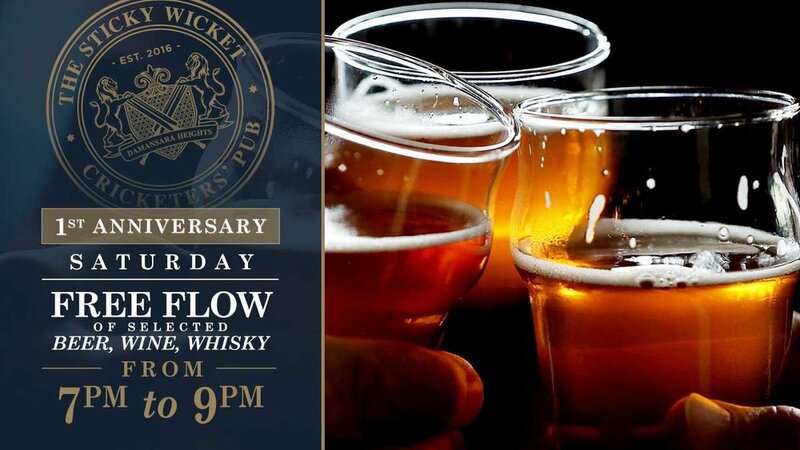 FREE FLOW on selected beers, wines & whisky. Only on Saturday. Raise a toast, blimey, raise a dozen while you're at it. No time like the present, eh? While stocks last, of course.